Finding the right topics for English literature PhD research proposal can be a tricky business. Make sure you get all the advice you need to choose the exact topic that fits you best. If you have a wide range of interests, it’s not easy to choose just one of the recent PhD topics. You’ll need to do plenty of thinking about the one major topic you want to focus on. Use the advice from English literature PhD thesis writing service below to help you on your way to academic success. PhD topics are no like any other research topics. This degree shows that you have command over your subject and it is reflected in your thesis. So, topic plays a very important role in the completion of your degree. Here is our guide to help in the selection of topic. Brainstorm your idea: the important thing is to select that topic, which you find interesting. Sometimes, we don’t know even our own interests. If this is the case ask few questions yourself and you will get some ideas. For instance, do you have any personal favorite in literature? Any school of thought or a particular writer who inspire you? You can write a thesis on the ideas and writings or a person, or the school of thought he belongs to. The Internet is flooded with the ideas, you can search different websites, something might click to grab your attention. You can write the ideas which come to your mind and can use them later to make a focused research topic. Background information: when you get few ideas, select two or three ideas, which you find most interesting. Get some background information about all of these. Read articles, books and use online sources to get information. During this search, you will be able to focus on one topic, which attracts you the most. Focus on one topic: now the point is to focus on one single topic. Keep in mind that topic should not be nither too broad or nor too narrow. If you are writing about a school of thought, write just one aspect of it. If you are writing about a person, focus on one aspect of his work. You can use different sources to get information about this particular topic. Keep your topic flexible: mostly, students have to modify their topic during the research. Due to literature and other constraints. So, keep your topic flexible, you might need to modify it a bit, or even a lot. Thesis statement formulation: once you are clear about the topic and have background information too, now you are ready to formulate your thesis statement. These are just the one or two sentences, which are the base of your research. These are just a few steps, which will help you to select the best topics for PhD in English literature. Make sure you keep in touch with your instructor and get guidance from him too. Blogging is killing literature or helping it to flourish? 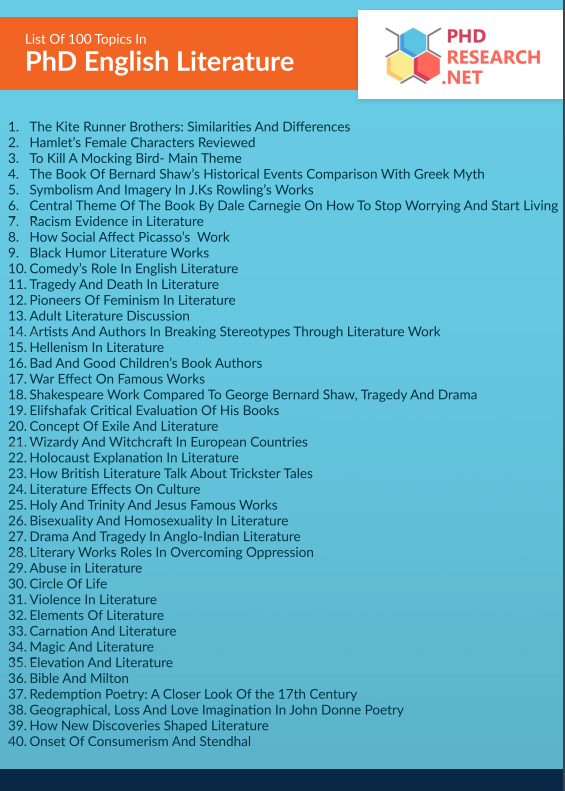 Download More Topics in PhD English Literature! 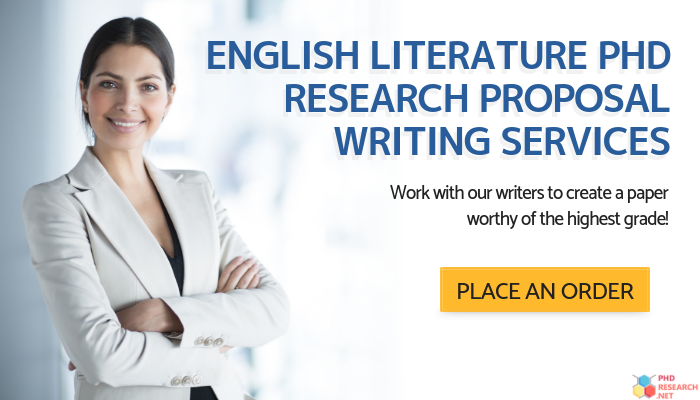 As with any subject of research, there are many ways you can approach the study of English literature. All PhD courses will provide the necessary training you will need to use various methodologies appropriately and effectively. Most research methods are specific to the exact region and period of time you are studying, but there are some commonalities that will be taught as part of the first year of your PhD studies. You will find that you learn through doing research rather than being spoon-fed theoretical information in isolation from actual research. The most important skills to obtain are those which involve searching through libraries of information, both electronic and physical. 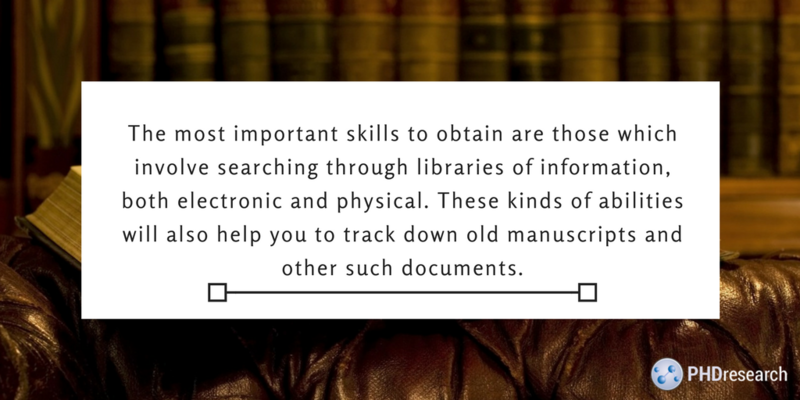 These kinds of abilities will also help you to track down old manuscripts and other such documents. You will also gain an appreciation for the scholarly method by which you can read and transcribe old manuscripts accurately. This approach allows you put your findings into context and pay plenty of attention to the detail of lesser understood documents. When you’re thinking of undertaking the writing of a PhD thesis in English literature topics are a vital consideration. It can be difficult to know where to start, so take a look at the tips below to see what you can do to get the ball rolling. When it comes to completing a PhD thesis in English literature topics that you thoroughly enjoy are your best allies. If you can find a novel angle to approach your favorite subject, you’ll find it as easy as it can be to find a PhD writing service and all the support you’ll need. You can develop your own unique idea by considering the most recent PhD topics in English literature. Read as much as you can of the most recent research published in your area of interest. You will need to focus on newer papers rather than older ones to make sure that you gain an appreciation for the latest presentation styles and methods of investigation. Once you understand the state of affairs in your chosen field, you’ll be able to slot your PhD research right where it fits as part of the bigger picture. The last thing you want to do is to repeat the findings of existing research to make sure you keep reading even after you’ve chosen a topic. You’ll need to keep abreast of the most recent publications by talking with your peers, supervisors and online experts. Only then can you hope to complete a worthwhile piece of research that’ll offer a completely new approach to a poorly understood topic. Those PhD topics in English literature that interest you most are the ones you ought to focus on. You can find out what enthuses you most by offering to assist faculty staff in their research. You might even end up being credited as a co-author of a paper you helped to research. Even if this doesn’t happen, you will have learned plenty about what a doctorate entails and you’ll be in a great position to pursue your own PhD. Need reliable PhD assistance in Australia? Our experts are at your service! It’s all well and good writing a research proposal, but you also need to consider the future. While obtaining a doctorate is a wonderful achievement, you need to decide whether it’s in your best interests. If you want to become a professor or a college instructor, a PhD is a great qualification to have. In the US, it is projected that there’ll be a 13% increase in job opportunities in this sector, mostly due to increases in student enrolment. You can expect to increase your chances of employment as a tenured faculty member if you continue your education beyond the doctoral level and gain more and more experience of research at this high level. Make the most of the above average hiring rates in the field of English literature when you gain the highest qualifications and get the best quality experience. Having examined all the above topics for PhD in English literature, you’re now in the perfect position to develop your own ideas. You’re probably still thinking about what doing a PhD will actually lead to in the future. This is a reasonable consideration and it’s very important that you complete a doctorate for all the proper reasons. Get expert advice online and make all the right decisions without delay. Even if you aren’t sure about writing skills you can always rely on professional help of our experts. They have an expertise in English literature research proposal writing and can craft a paper from scratch for you. Give your work a professional touch and get a final draft that meets all your requirements and expectations! Obtain expert advice when you’re exploring topics for PhD in English literature. With the right support, the world is your oyster!